Its 2:00pm and Menai Library has been invaded by animals as well as 29 excited children. There are lizards running around on the floor of the reference room, frogs climbing up the walls, turtles slowly working their way across tables and a snake has found a hiding spot under the shelves, to escape the chaos. Black headed snake, originally uploaded by Sutherland Shire Libraries. 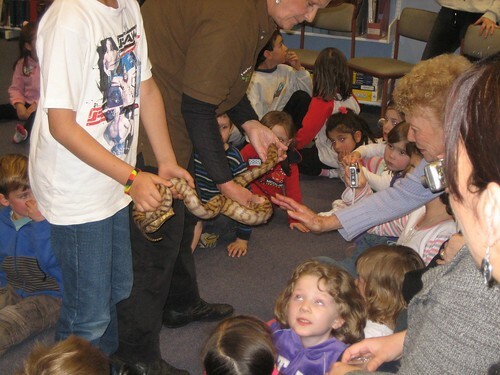 While we did have animals in the menai library on the 15th of July 2009, both animals and children were very well behaved with their handlers Darrelyn and Tara from Feature Creatures: Mobile Reptiles and Amphibians and parents standing close by. As well as a Nature table displaying smaller creepy crawlies. Fun was had by both animals and people alike.